Reconsider strategy and make planning relevant. In Bringing Strategy Back, strategy expert Jeffrey Sampler cuts through the clutter to reveal exactly why the usual tools of strategy are so sorely out of sync with our needs: windows of opportunity close far faster than they once did, many of these opportunities are smaller than they once were, growth rates are uneven across markets, and today’s competition is more asymmetrical than ever. The upshot for managers is that they need to reorient their approach to absorb the shocks and surprises that strike at a moment’s notice. Only then can strategic planning reliably play its part. Leaders all around the world at organizations of any size and type will benefit by shedding their obsolete notions about strategy and becoming more resilient. Bringing Strategy Back rises to the challenge and presents a new prescriptive model. 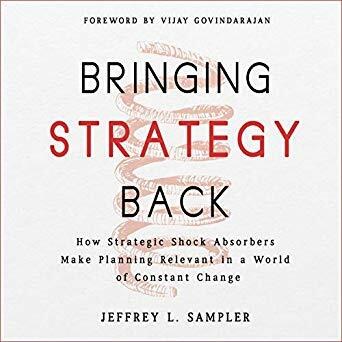 It introduces four “strategic shock absorbers” that enable leaders to build resilient organizations that can withstand even the most unexpected global turbulence. Based on the author’s in-depth research in the world’s most tempestuous markets, the model delivers several must-have qualities that interact and work together in an ongoing process: accuracy, agility, momentum, and foresight. With this new framework, Bringing Strategy Back shows how to be prepared and proactive, rather than reactive, even when the future is uncertain.